Sauer Health Care is nestled along the bluffs of the Mississippi River in the Winona Community. Sauer strives to provide quality care for all residents; physically, spiritually, and mentally. As part of the community for over 50 years, Sauer Health Care provides hospice services, physically therapy, personal care and more to help ensure quality of life for each resident. The staff truly care about the residents and there are always activities going to fit everyone’s interests. Sauer Health Care believes it is important to listen to their residents and prides themselves with orienting their services to fit their needs. Sauer Health Care’s new website certainly fits the feel of the organization. It is modern, professional, and looks amazing! Our team updated their website to a user friendly WordPress site that allows the staff to make changes with ease. The new website is very easy to navigate for both residents and their families, as well as the staff and potential employees. Sauer Health Care believes in the importance of providing important information on the website for clients about the health care facilities as well as the transition to long-term care. Our team provided easy to find resources and calls to action giving potential clients the means to reach out to staff at Sauer Health Care. The website is also mobile friendly and ADA compliant granting access for all viewers. 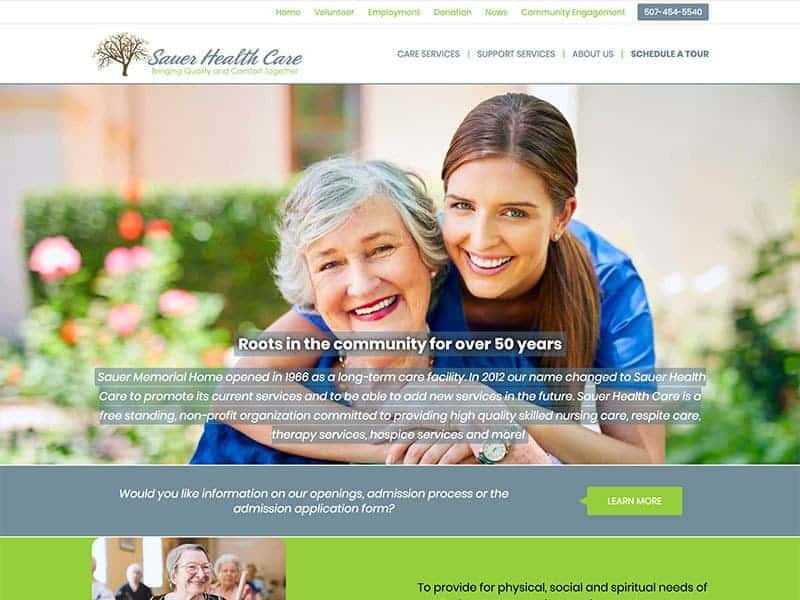 Take a look at the new Sauer Health Care website. Welcome your viewers to a modern and professional website. Contact us to learn more!